Overlooking the renowned Pearl River and facing the White Swan Pool, the newly renovated White Swan Hotel enjoys being a unique oasis of relaxation hidden on the pretty island of Shamian Island. 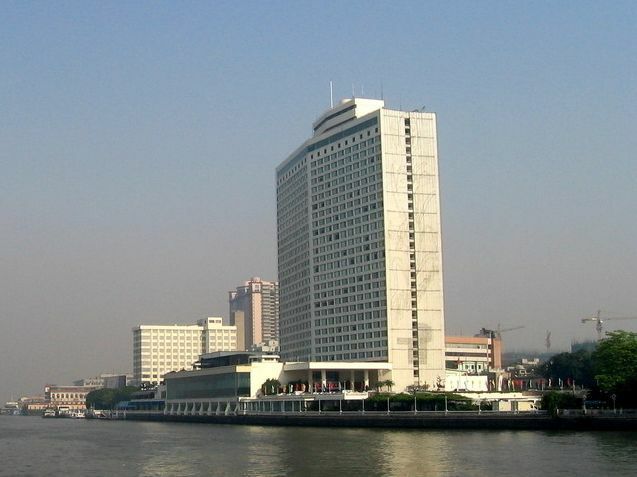 And the hotel boasts convenient transportation: 4 kilometres from the city centre and 7 kilometres from the Guangzhou Railway Station, while the airport is 20 kilometres away. And the hotel provides free shuttle bus every one hour from 7:15 am to 18:15 pm to the Guangzhou East Railway Station (Tianhe) and Shangxiajiu Pedestrian Street (Guangzhou renowned shopping area). The exquisitely beautiful Atrium lobby is an indoor microcosm of the famed landscapes of Southern China. Here waters abound, with a veil-like cascade and a spectacular rockery. Atop the rockery sits an elegant Chinese pavilion, octagon-shaped, with its richly ornate gold top, and a profusion of luxuriant vegetation and flowers. The hotel offers guestrooms that are elegantly designed and well-appointed with a host of modern amenities. Attentive room service is also provided for your convenience. The onsite restaurants serve Chinese, Western as well as Japanese cuisine for you to enjoy. You can also sip your favorite drink as well as relax in the cozy atmosphere of the tastefully designed bar. The hotel offers multi-functional meeting rooms for organizing your conferences, seminars as well as banquets. Health conscious guests can workout at the well-equipped fitness centre, have a bracing dip in the swimming pool, indulge in the game of tennis or relax at the sauna. And colourful experiences for the guests are also sophisticatedly planed: Sing High Karaoke, River Room Night Club, White Swan Beauty Salon and Car rental from Rolls Royces to tour buses for Guangzhou city travel. The White Swan has 843 guestrooms. Guestrooms are partly carpeted and partly tiled, with pastel décor and Chinese prints. Minibars, refrigerators, complimentary bottled water, and coffee/tea kettles provide refreshment. High-speed Internet access is charged on a half-day basis, but no more than a set limit in any one-month period. Cable/satellite TV channels include CNN, Star Sports, HBO, Discovery Channel, and National Geographic, as well as Hong Kong, Japanese, French, and German channels. Bathrooms have black-and-white trim, gold-colored fittings and white marble floors, plus extra-large towels.